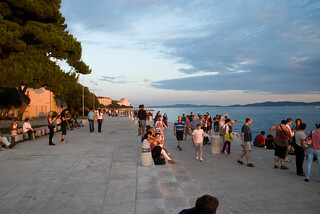 Zadar is on the Adriatic coast of Croatia. I’d never heard of it before Ryanair started flying there from Edinburgh in Spring 2009. 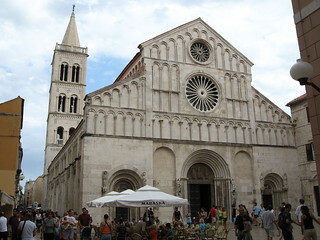 However, after visiting Zadar I’d recommend it either for short breaks or as a base for exploring the surrounding area. Two of my favourite Zadar attractions are on the prom. There’s the Sea Organ which emits sounds produced by the movement of the waves or wind and Greetings to Sun, a solar powered lights show in a giant circle. If you’re lucky you can catch a wonderful sunset from the prom. The Antique Glass Museum, in the restored Cosmacendi Palace, houses a collection of glass dating from Roman times including large urns. You can also watch live glass blowing demonstrations. There are also the National and the Archaeological museums. The closest beaches to the city, both pebbly, are Kolvara and Borik. If you prefer a beach with some sand, you’re best to head toward the village of Nin about 8 miles from Zadar, where you’ll find Zaton Beach. Nin is an historic town with the smallest cathedral in the world. A fun thing to do in Zadar is to take the small rowboat ferry across from the Old Town, where the rowing is done standing up. There are plenty of boat trips to the islands in the Zadar Archipelago which are priced at around £30 including lunch. 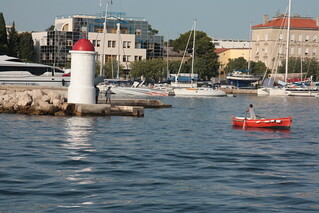 The two islands closest to Zadar are Posman and Ugljan. Zadar has plenty happening on the music front. The Garden Bar, set up by UB40’s drummer and producer is the spot to chill out in the evening. 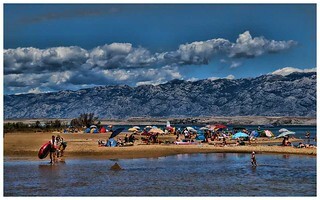 There’s a programme of Summer music festivals at the village of Petrcane near Zadar. Several national parks are accessible as day trips from Zadar. The Krka Falls Park, reached by boat from Skradin, is so dramatic and beautiful and the nearby town of Sibenik feels more like being in Italy. The Kronati Islands Park, encompassing more than 130 islands, is good for diving. 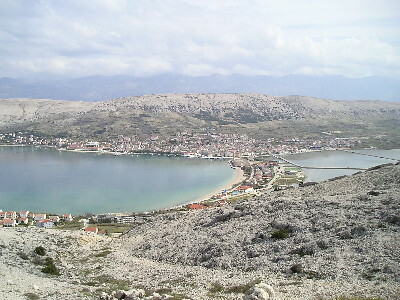 The island of Pag, reached by bridge, is famous for its goat’s cheese and lamb, plus there’s a large sandy beach next to Pag Town.